The Bär was a large self-propelled vehicle mounting an awesome 30.5cm weapon. The running gear was largely to be taken from the Tiger tank, but rather than torsion bars, leaf spring suspension was to be used. These springs would have most-likely resembled a larger version of the Panzer IV leaf spring mounting. Similar systems were suggested for prototype Jagdpanzers which were on the drawing board toward the end of the war. 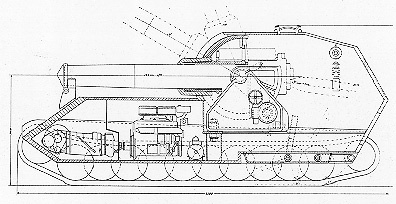 The gun was rigidly mounted, but provision was made for a wide range of elevations. These features make the Bär closely resemble the Sturmtiger.